Studying in Japan is expensive. Or so you think, don't you? However, the Japanese government and many universities are currently focusing their attention on welcoming more international students. This project goes further than mere financing: they are arranging a variety of support structures too. So, if you are planning on studying in a top level international institution, we strongly recommend considering Japan as a serious option. Study abroad students are presented with cheaper tuition fees than Japanese university-goers, which set Japanese universities as an almost worldwide exception. 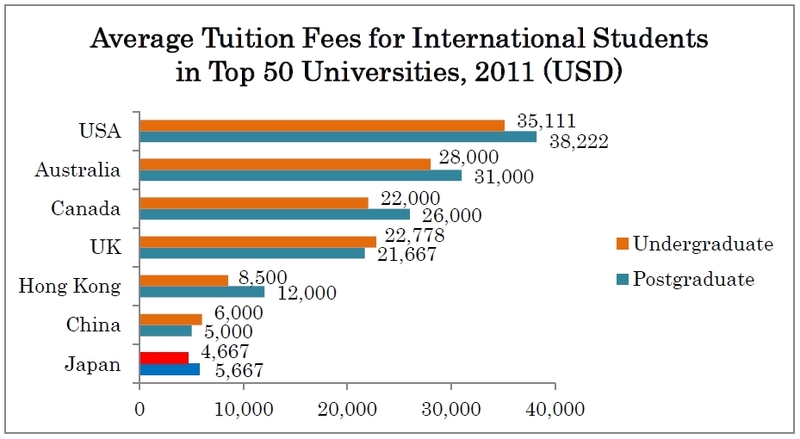 In the following diagram, courtesy of QS World University Rankings (2011), we can compare the tuition fees of the top 50 universities in the world, and realize their comparative cheapness. Approximately 70% of study abroad students in Japan are granted a scholarship during their stay. The Japanese scholarship system allows for government-funded as well as business, foundation and university-funded grants. Thanks to the substantial number of scholarships provided by Japanese national and public universities, the majority of study abroad students receive such grants. In addition, since many graduate (Master's and Doctorate) students tend to receive scholarships from non-governmental organizations, there is a great number and amount of scholarships. Therefore, it is possible to concentrate on one's studies without having to worry about financial issues. Another characteristic trait about Japan is that the host, i.e. the Japanese government, provides assistance to study abroad students upon acceptance. Japan is currently managing “Global 30”, a plan aimed at globalizing its universities, and is making every effort to improve its stance regarding support towards study abroad students, etc. Keeping in mind the large scale governmental budget, the government is arranging for comparatively abundant scholarships. (Reference) Is Japan really that expensive compared to costs of living in other countries? The price of a Big Mac is often used to define the living standards of a country. The table above presents school expenses and scholarship budgets in five countries, whereas the following graph displays their cost of living. Please use this diagram as reference in order to estimate the true value of these grants. Incidentally, it is often said that “living in Japan is expensive”, but we believe one has to differentiate life in Tokyo and other towns. While living in Tokyo is expensive, we cannot say that the average life expenditures are exceptionally costly outside the capital, probably thanks to the cheap cost of goods and taxes as well as the nationalized infrastructures and transportation system. To put it bluntly: if you feel like studying in Japan, now seems to be the time!